Make Los Angeles Scene Part of Your 2014 Marketing Strategy! Committed to helping bridge the connection between customers and businesses while offering Exclusive Los Angeles Scene Deals, Products, Promotions & Services. Give people the opportunity to find you on Los Angeles Scene. You know they’re looking! Los Angeles Scene offers a range of advertising opportunities including banner ads, sponsorships, dedicated posts, and more! Get Listed in our Directory and increase your business visibility. Submit your Business Listing and expand your visibility by joining the Los Angeles Scene Community. Fill out the form below and an Advertising Account Manager will assist you in advertising your business on Los Angeles Scene. Attract Readers directly through our Digital Newsletter Via-Email. 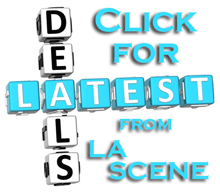 Find incredible products, services, deals and latest news in the moment that is now on Los Angeles Scene for Californians and the rest of the world!